Amazing photography isn’t only about what you shoot and how you shoot it, it’s also about what you shoot it with. The high resolution, multi-featured Nikon D7000 gives you 16.2 megapixels of vividly detailed images, a more sensitive DX-format CMOS sensor that delivers high ISO with low noise, plus various automatic and customizable settings to take your pictures and videos from great to gorgeous. Shoot up to 6 fps or record every second of the action with full HD 1080p D-Movies with Nikon’s advanced autofocus system to impress and inspire. Whether you want to make large prints or crop tightly in an image, the D7000 delivers the resolution you need. At its heart is a DX-format CMOS image sensor with 16.2 effective megapixels, optimally engineered to gather more quality light through sharp NIKKOR lenses. Coupled with 14-bit A/D conversion (12-bit selectable), the D7000 produces stunning images that are richer in tone and detail than previously possible in DX format. The D7000 is equipped to help you create impressive cinematic masterpieces with Full HD 1080p and movie editing functions for exceptional scene reproduction and quality. In addition to smooth video, the camera can compensate for distortion and other image-degrading problems. Aside from a built-in monaural microphone, the D7000 incorporates an external mic jack for high-quality stereo sound recording options. Say farewell to missed opportunities. The D7000 incorporates a new driving mechanism to conduct its remarkably fast and precise mirror movements, giving you an approx. 0.052 second release time lag and an approx. 0.13 second start-up time. What’s more, you can continuously shoot at approx. 6 frames per second at both 14-bit and 12-bit A/D conversion for RAW shooting. ISO 100 to 6400 has now become standard with the D7000, enabling you to handle a wider range of lighting situations: from the bright and sunny outdoors to low-lit evenings and interiors. Nikon’s renowned noise reduction technology has been upgraded even further. Throughout the range, the D7000 delivers sharp images with minimized color noise. Quality, high-ISO performance can also enhance your movie shooting, allowing you to capture the mood of a scene using only available light. After the incredibly accurate 2,016-pixel RGB sensor reads a scene's lighting information, the D7000 cross-references what it sees with imaging data from a large selection of real-world shooting situations. This way, the renowned 3D Color Matrix Metering II delivers exposure results that are faithful to how you see light and shadow interplay, even in difficult lighting situations. This intelligent metering technique also delivers exceptionally accurate i-TTL flash exposures, and it all happens within milliseconds for both speed and precision. The D7000's strategically positioned 39 AF points cover a significantly wide area of the frame, giving you flexible compositional possibilities. The 9 AF points in the center utilize powerful cross-type sensors—especially useful when you need tack sharp focus, such as with portraits and macro work. The D7000 offers a variety of AF area modes, including Dynamic-area AF using 9, 21 or 39 points. Utilizing Nikon's Scene Recognition System, Auto-area AF properly judges the main subject within 39 AF points and focuses on it. The newest generation image processing engine, EXPEED 2, is capable of performing multiple tasks with more speed and power. Expect smoother tonal gradations, even in difficult shadows and highlights, for a greater sense of depth in your images. 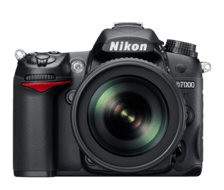 With a top and rear cover of durable magnesium alloy, the D7000 is ready for the outdoors. Nikon engineers paid meticulous attention to where exterior parts join by employing durable sealing against moisture and dust. The compact body has also undergone severe environmental tests to prove its rugged reliability. With approximately 100% frame coverage in the viewfinder, what you see is exactly what you capture. The specially coated glass pentagonal prism and precision-crafted finder screen offer not only a bright viewfinder image, but also enable you to easily confirm when a subject is in focus. The D7000 features an expansive 3-inch VGA LCD. Its approx. 921k-dot resolution assures clear, detailed display of images, which proves invaluable when confirming focus or assessing image sharpness. AI-P NIKKOR: All Functions Supported Except 3D Color Matrix Metering II. DX AF NIKKOR: all functions supported. Non-CPU: Can be used in modes A and M; Color Matrix Metering and Aperture Value Display Supported if user Provides Lens Data (AI lenses only). Other AF NIKKOR: All Functions Supported Except 3D Color Matrix Metering II. PC Micro-NIKKOR does not Support some Functions.